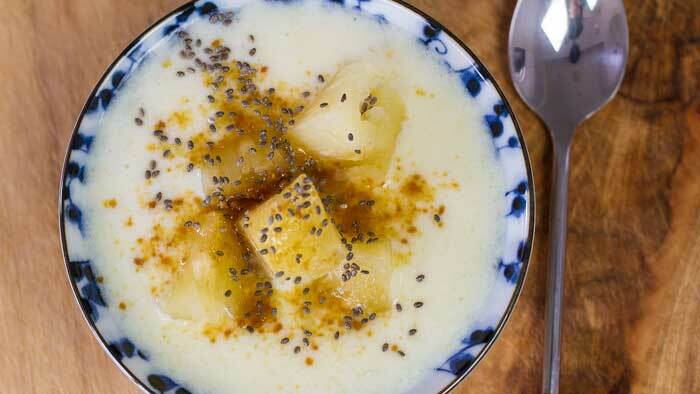 Today I show you how to make a quick and easy pineapple breakfast pudding – this is smooth and creamy and would make a great yoghurt alternative. This breakfast pudding recipe is eggless and dairy free… which means it’s also totally plant based and cholesterol free! Measure your milk into a mixing bowl. If you don't like chunky pudding, blend pineapple pieces and juice till smooth. Add pineapple mixture to bowl. Add vanilla extract and mix together. Add 1 - 2 tsp guar gum. Amount used will depend on how thick you like your pudding. Spoon into a serving bowl or put on top of fruit salad/cereal etc and top with chia seeds and a sprinkle of coconut sugar. YUM!